Chatroom will be live, so come join us there! BYOCHAMPAGNE! If there is life in another galaxy far, far away, they surely heard the cheering! 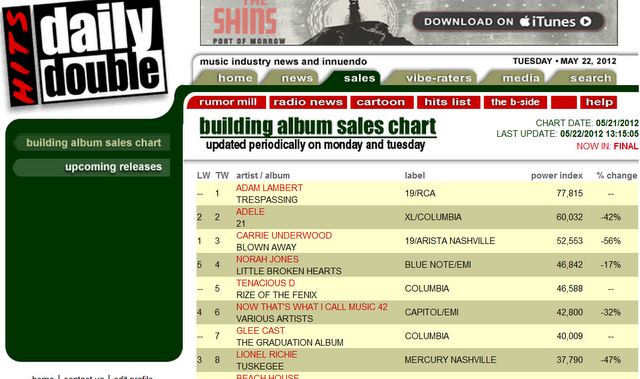 Adam Lambert’s new album “Trespassing” debuted at #1 on Hits Daily Double for the first week of sales! Billboard has been predicting at least Top 3 and possibly #1. Let’s Celebrate! Tonight we’ll talk a little business – about charts, reviews, appearances, etc. and their effect on album sales. What matters, what doesn’t? Adam’s public appearances – how is he being received? Audience’s favourite songs? These are the sort of issues Glamberts fret about, so let’s put all that energy to good use! And of course – there will be music! On the scale of things…I tend to think like Adam. As long as his music is “his music” i.e.not doing a style of music to please others…as long as his sales are good (which they are great), the product is being received well (rave reviews from critiques and fans) and he can sale tickets at concerts (they sale out fast), then he has done his job. Adam feels music is art…and I am an artist so I totally understand him. I do my style of art…I do not do art just to please others…I do what makes me feel good…if it sales great.